Next, go to the Carpenter’s workshop and add a ton of cages (j is the shortcut from the Add Task menu). Try and get ten built. Add another carpenter’s workshop to your workshop floor if you fancy, makes it easier to queue up more than a few of any item and get things made faster. At the front entrance, hit b.
Scroll to Traps/Levers and hit Enter, or just hit T.
You will now see a list of traps, lets briefly discuss them. These are simple one-shot traps that drop a big rock on an enemy’s head. These are great for a quickly built defence, but clearly, as one shot traps, a little limited. Note, with all traps, if your dwarfs fall onto them, unconscious, they will trigger the trap! These will probably be your bread and butter as they will attack any enemy triggering them and with multiple weapons can be quite powerful. Not a trap, but a device used to manually trigger things like bridges, cages, doors, floodgates, supports, etc. More on these later some time. Can be part of a complex trap or can be used to trigger other objects when conditions are met (such as water being on them, creatures stepping on them, magma flowing over them, etc). More on those later too. What we’re going to be working with in a moment! A trap that catches the enemy in a cage. You can then do amusing things with the trapped bad guys, like tossing them off a tall bridge, dropping them into magma, or stripping them and using them for military sparing practice. Good fun! A peculiar sort of trap device that can only be triggered by a pressure plate or lever. 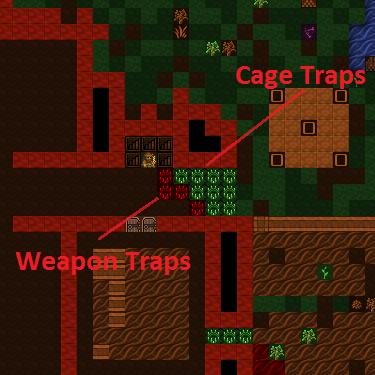 You should read about traps and trap design on the wiki for a lot more detail, but only after you’ve completed this tutorial, ok?! For now, get back to work! Scroll down to Cage Trap and hit Enter. You now have a green X, place it in front of your entrance somewhere with Enter. Do this a few times, you can see below how I’ve set a few traps to be built. This is hardly an impressive defence, but it will do for now. With luck it might help against any casual raiders, although sneaky ‘trapavoid’ monsters will still be able to sneak past your traps. To beef our defence up a bit we need to get some weapon traps installed as well as sort out some way to strike back at attackers who aren’t so gracious to step on all of our traps. So with that in mind, get producing a lot more mechanisms (at least 10) and follow along as we produce some trap components! 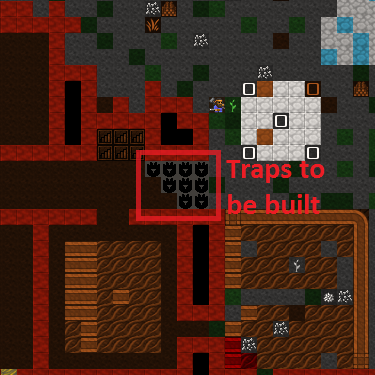 This wouldn’t be a dwarf fortress if we didn’t fill the place with the clang of forge hammers and the stink of furnaces, right? Lets have some fun then and make some sharp things to hurt our enemies! If you haven’t dug up any Magentite yet, this is a good time to go find it - it’s a form of iron ore, and we can’t smelt iron without any ore! Select Make Charcoal, on r repeat. With the job selected, Alt-w to open workflow. Set this to keep 5 to 10 charcoal bars available. Now go to the smelter, and try to a, Add new task. You’ll see a list of the tasks available at this workshop. Note, the tasks will change as you uncover more ores or deplete older ores. For interest, note that you can set the workshop to melt objects you wish to dispose of (turns the object back into a metal bar). More on that some other time. Chose Smelt Magnetite Ore, hit Enter. Magnetite is a form of iron ore, so some of the rocks lying around will become iron bars. Fill the queue and then fill it again (or build another smelter and fill both queues). Once we’re done with this tutorial why not go and smelt all of that native platinum ore you saw on the list as well? If you’ve dug downstairs out you may have gold to smelt too! Your dwarfs should be pretty busy now, hauling charcoal, wood, ores and bars around. While you’re at it, make sure you’ve got enough wood around for charcoal by cutting more down outside! If you want to check your progress, go look at your Bar/Block stockpile and see what is being built up. If you suspect all of your production is in bins, use k, find the bin, hit Enter and look inside it. While all this is going on, why not go to your farmer’s workshop and add a task of Process Plants (to bag). Set it on repeat. Then add a task of Process Plants (to barrel), again, set it on repeat. Now some dwarves will process anything you’ve grown that needs processing. I won’t list those plants here now (go look at crops for all the detail), but suffice to say, some plants need to be processed so they can be eaten or used in other sorts of manufacture (eg, cloth making). Hopefully you’re not short on bags. If you are, try and pick up a bunch off a trader. Alternately, buy leather and/or cloth off a trader and using the Leather Workshop or Clothier’s Shop (we’ve not built one yet) make bags. Bags are very handy for storing seeds and processed plants, you can never have too many of them. They’re like barrels and bins in that way. 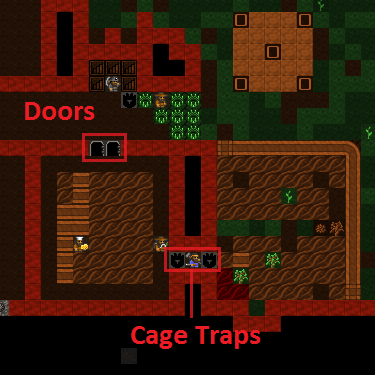 I also just noticed that our farm entrance was entirely undefended, so I added some doors and cage traps. Hopefully that’ll be enough! Hit q, a You will now see a list! Explore the list, see all the neat things we can make! You might need to hit Tab to expand the menu size so you can see everything. Scroll to Trap Components and hit Enter. Scroll to Iron, hit Enter. Hit Tab, Tab so we can see the full item names. Chose to make a large, serrated Iron disc. I love the sound of that! At this point you might want to think about other items you’d like to make in due course. Hit a again and then hit space to back down the make-item tree. Chose Weapons and Ammunition, chose Iron and let’s make three Iron warhammers. These will come in handy once we start our military. I like warhammers because it’s funny to watch goblins fly a half dozen tiles and then expire in a heap. Once you’re confident your items are made, go back and make sure you’ve got some more charcoal in production, you’ve got more ore being smelted and add, under Armor, three suits of iron chainmail and three iron shields. This will all come in handy later. Oh, you may be getting annoyed at slow production. I know it’s been bugging me. Perhaps it’s time to pack your production rooms with more smelters and charcoal burners. One issue you’ll face is you need to make or buy an anvil off the traders in order for you to make another metalsmith’s forge. Keep it in mind for your next trading deal. The other thing to consider is setting up Workflow for every step - automating complex industries like steelmaking (or soap) is exactly what it’s designed for. Once you’ve got your nice, big spikey discs, head back to your entrance. Get ready for trap placing fun! Go to place another trap, a Weapon Trap this time. From this screen you can chose the weapons you want to deploy with your trap. 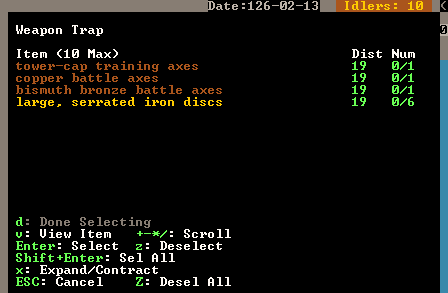 Facing goblins, we really only need one awesome iron disc per trap I think, but we’re able to select more if we wish. Scroll to the large, serrated Ir… and hit Enter, you’ll see 1/3 selected. Weapon traps can have up to ten weapons each, but we need to save some for the other traps! Hit d for Done Selecting. Your first weapon trap is now placed! Place three more. Weapon traps are great ways of getting rid of a bunch of trash weapons you might have lying around – this is particularly the case once you’ve killed off a few goblins and have their rubbish cluttering up your piles. When filling a trap with weapon trash you might want to put ten low-quality weapons per trap, to ensure maximum damage! Here are my traps, laid out. I’m actually going to add another row of slicey dicey weapon traps as I don’t have a military and I’m a bit paranoid. Do something similar! Well done on the trap placing! But we’re not done with our defences just yet. We need to stop our drunken citizens from casually strolling into an invading army - and that means the Burrows system! “Wait!” you’re probably thinking, “Why do we need filthy burrows when we have a perfectly good fortress?”. Well, I’m glad you asked! Want some more detail? You’re in the right place! Start by hitting w for the burrows menu, and a to add. As shown in the gif above, Enter to designate is the important thing. Cover the whole underground area, since it’s safe there, and n name it something like “Inside”. The key feature here - for civilians, the military is complicated - is that on the left we have ALERTS and on the right we have BURROWS. This means that we can set non-military dwarves to be confined to a burrow, and change which if any that is with a single alert setting. This is the m military a alerts screen, which is also used for for civilian alerts. c to add an alert, then n to name it. I called mine “Siege” because it’s to use during a siege. Yep. Now move the cursor to the BURROWS column, and hit Enter to associate that burrow with your new alert. You’ll see a green A next to the burrow when you have that alert selected. Hit Esc a couple of times to get out of the military menus. You’re all set up! In case of invasion m, a, select the Siege alert, Enter, and you should see a green [CIV] next to it. Congratulations, your civilians are now confined to the burrow! Watch any civilians who were outside drop what they were doing and come running back inside. Note they will not go for food, so your safe room may become a death sentence if there’s no supplies (but that shouldn’t be a problem by now, right?). When the ‘fight’ (against brave… traps) is over, come back and select Inactive and hit Enter to cancel the alert and let your civilians back out of the burrow - that’s all there is to it. Anyway, that’s enough to now. Get on with building lots of traps, making bags, armor, barrels, food, bins, shields, weapons and so on! Go to it, and I’ll see you in the next chapter!. 6.2. Smelting and other dwarfy things! 6.4. Back to the iron!